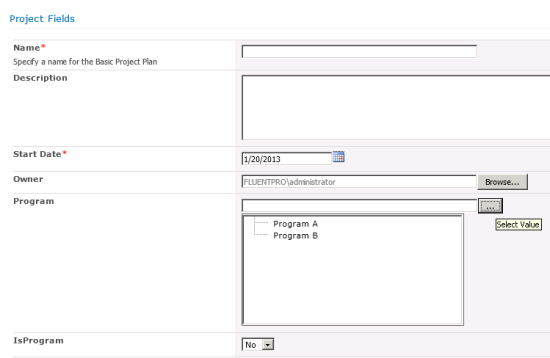 In this post, I will cover how the Program support can be enabled using another product from FluentPro products portfolio - FluentPro Autocomplete Manager. I assume that Autocomplete Manager is installed and licensed. 3. Create 2 projects, Program A, Program B and "check" IsProgram field. 5. Got to Server Settings -> Project Detail Pages and open Project Information PDP for edit. next to Program name and Portfolio Name fields you will see icon - that's icon for Autocomplete Manager settings for that field. 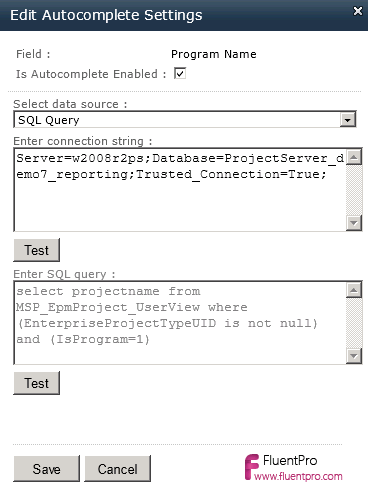 You can test both connection string and SQL Query for errors in run time by clicking on Test buttons. 8. We should be all set. Let's save changes to PDP, go to Project Center and create new project. That's it. In case of using Autocomplete Manager, your system is very dynamic, no server side jobs needed. Very easy to use. Both approaches have cons and pros. If you prefer to use Lookup Tables - then you can use Lookup Manager. If you are fine with content from data source directly and good to go with values in text fields only - Autocomplete Manager provides the most easiest way . 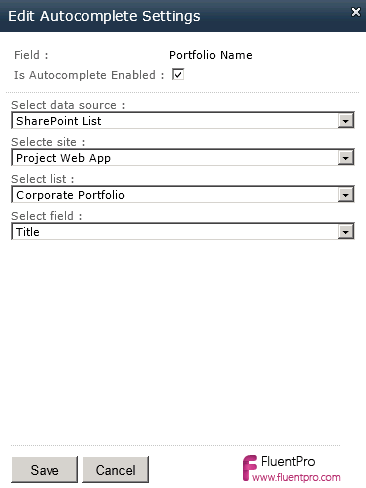 Note 1: We covered using Autocomplete Manager for SharePoint Lists and SQL Server. In Addition, it allows to use it as "People Picker" picking data from Project Server User Groups. Note 2: Versions of Lookup Manager 2013 and Autocomplete Manager 2013 for Project Server 2013 are expected around mid-February. Let us know if you have any questions - we would be happy to answer all of them. Many organizations that have a more than average number of projects, usually are grouping projects into programs and portfolios. In this post and next one I will describe the best ways how to enable support of "Programs" in Project Server 2010 and how our products can help. In Project Server by default there is no concept of "Program", but project sever supports the so called "master project" / "subproject" functionality. That means, that users can insert projects into one project (usually a "container" project) and that project can become master project and a "program". This approach has multiple advantages and disadvantages (you can see everything in one place but the same time there are multiple challenges with edit / read-only, it is very hard to deal with projects that contain tens of subprojects). You can search in Google /Bing for more information using the keywords "master project subproject project server 2010" and will find additional information. Another approach is to create one field with lookup table - Program Name and use it as selection / dropdown for selecting programs from that dropdown. There is one big disadvantage of this approach - user needs to support content of that lookup table manually, but with small number of programs this works better and is a more "cleaner" solution. In this post, we will create overview for implementing this approach with help of one of our products - Lookup Manager, product that allows sync of custom lookup table with data from SharePoint list or any database. Program (Text, project level, referencing Program lookup table). we will add both fields (IsProgram and Program) to Project Information PDP. 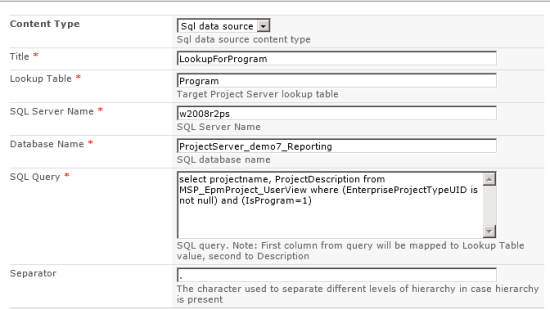 As next step, we will configure installed Lookup Manager to read data from Reporting Database. 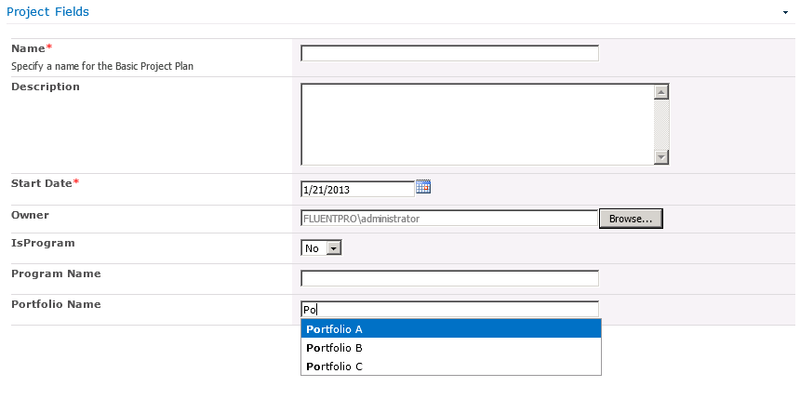 We want to select all project names that are programs (have IsProgram set to 1 (Yes)) and add them to than lookup table. 1. Go to Site Actions -> View All site Content and click on the list"FluentPro Lookup Manager". 2. 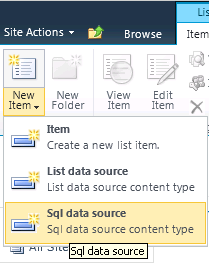 Go to Items -> New item -> SQL Data Source. That will open window where you need to define a sync rule. 4. For this scenario, we will set it to work every 5 minutes - it means, system will query database every 5 minutes and if required will try to update lookup table with values. - Go to Central Administration -> Monitoring -> Timer Jobs -> Review Timer Job Definitions. - Change schedule and click OK.
5. Let's create 2 projects that are programs: Program A and Program B (do not forget to set IsProgram field). That's it. If you do not create programs very often, you can set the job to run once a day or on any desired schedule. - Data can be synchronized from SQL Server as well as SharePoint data sources. - We support multi-level lookup tables (data in source should use the separator for each element: Level1.Level2.Level3) Any number of hierarchy levels is supported and separator is configurable. 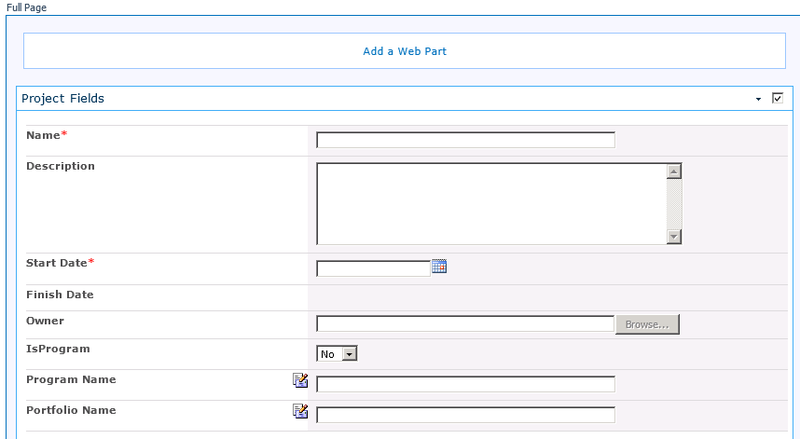 In next post, we will describe how to implement support of programs using Autocomplete Manager. REDMOND, WA, USA, January 15, 2013 — FluentPro Software Inc, a leading software development company for Microsoft Project Server platform, is pleased to announce the release of the new product for building dashboards for Project Server platform – FluentPro EPM Pulse – to the general public! Effective immediately, customers can purchase EPM Pulse directly from www.fluentpro.com or from over 15 partners and resellers all over the world. As the one of leading software development companies for Project Server platform, FluentPro developed over 400 reports and dashboards for customers and partners. 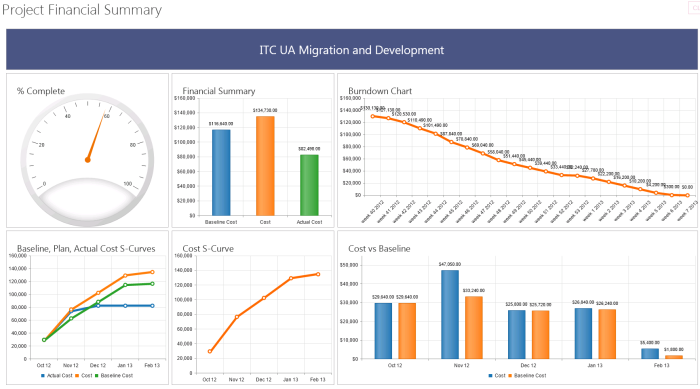 All these reports and dashboards solve specific problems of EPM reporting for customers and require IT engagement, however, they do not enable organizations to see all the data that Project Server stores or provide the ability to analyze the data and present it without additional processing. EPM Pulse is closing this gap – platform allows any Project Server user to build contemporary project and portfolio dashboards using over 130 pre-built building blocks in dashboard designer using drag-and-drop, just in minutes, without any training and writing any code; share it with peers and present them to executives. Supporting over 12 different types of charts – from gauges and bar charts to the tables and scattered charts, EPM Pulse provides a solid platform for quality EPM dashboard design in minutes instead of days or weeks. “EPM Pulse is a revolutionary product for Project Server industry and is a great fit for companies that use or plan to start using Project Server. Project managers can start reporting and analyzing project progress the way they want to. Companies can increase transparency of their project management process and make it measurable. Building new dashboards with EPM Pulse takes just minutes, not days or weeks and there is no need to engage IT. Great advantages for business.” said Anton Kravtsov, co-founder of FluentPro Software Inc.
FluentPro EPM Pulse is available as hosted option from Bemo (http://www.bemopro.com), our premier Project Server hosting provider. FluentPro (http://www.fluentpro.com) is a certified Silver Microsoft Partner that specializes exclusively in product development, complex custom development and Business Intelligence for Microsoft Project Server 2010/2013. FluentPro has developed over 15 products, including popular FluentBooks – the only configuration management and migration software for Project Server 2010 / 2013, FluentPro Cloud Migrator that enables migration of Project Server 2010 configuration and data to Project Online. With one of the biggest team of software developers among MS EPM Partners, FluentPro delivered a number of custom development projects to customers and other EPM partners; helped partners to develop their products and bring them to the Project Server marketplace. FluentPro has offices in Redmond, WA, USA and Richmond Hill, ON, Canada and software development center in Ukraine.